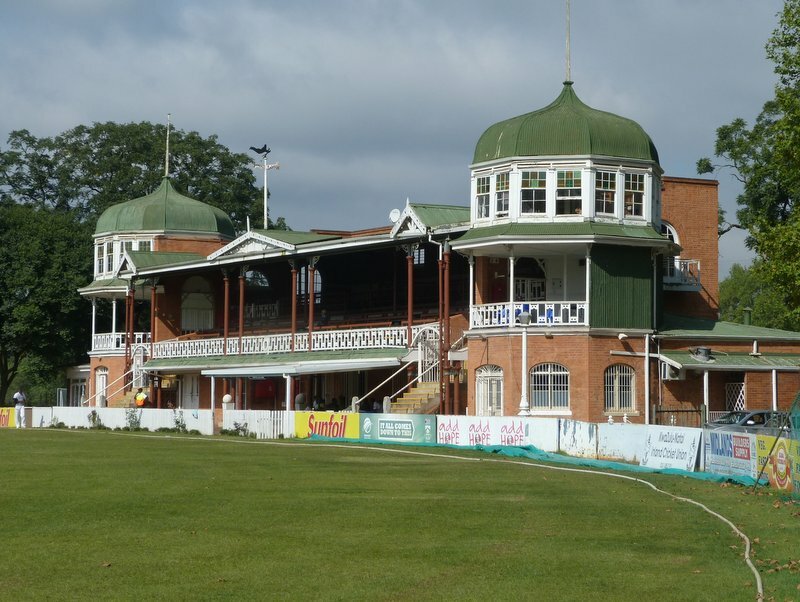 It’s the end of another cricket season out here and when I saw that the Dolphins were playing their final first class game at Pietermaritzburg Oval I thought it would be a pleasant way to spend a Sunday morning before heading off to the horse racing at nearby Scottsville. Sunday was the fourth and final day and I’d been following the game’s progress on Cricinfo in the hope that it would actually make it that far. 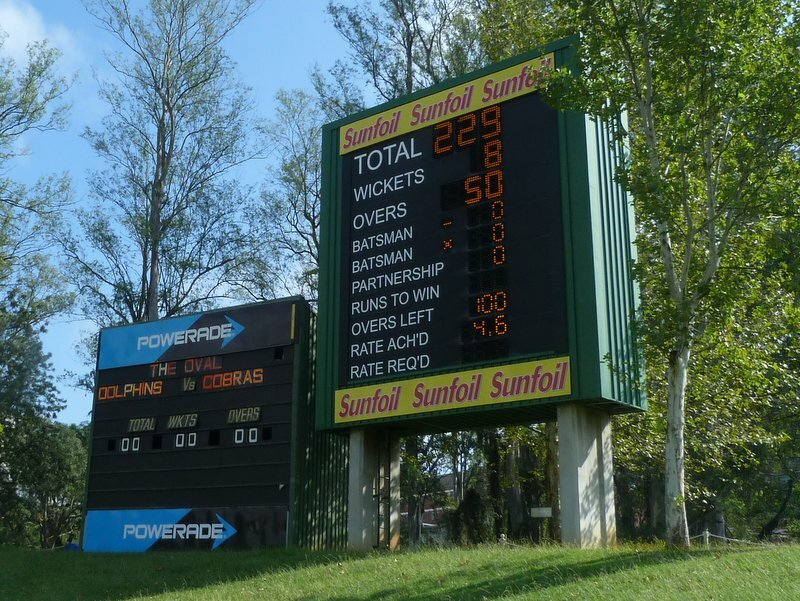 The Cobras had batted first and got close to six hundred before bowling out the Dolphins cheaply and making them follow on. 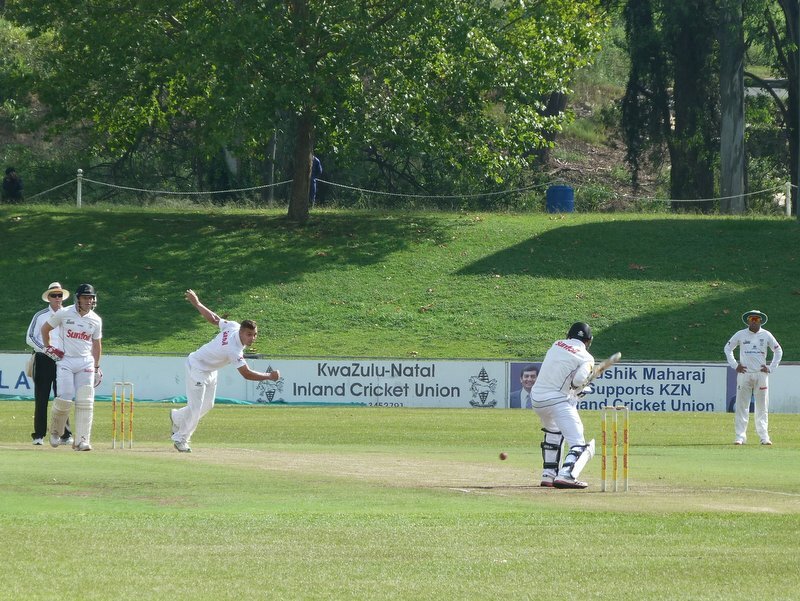 By close of play on the Saturday night the home side had just four second innings wickets remaining and still needed 126 more runs to make the Cobras bat again. With that in mind I wasn’t expecting play to last for long the next day and so Jen and I set off early enough from Durban to be there for the nine o’clock start. 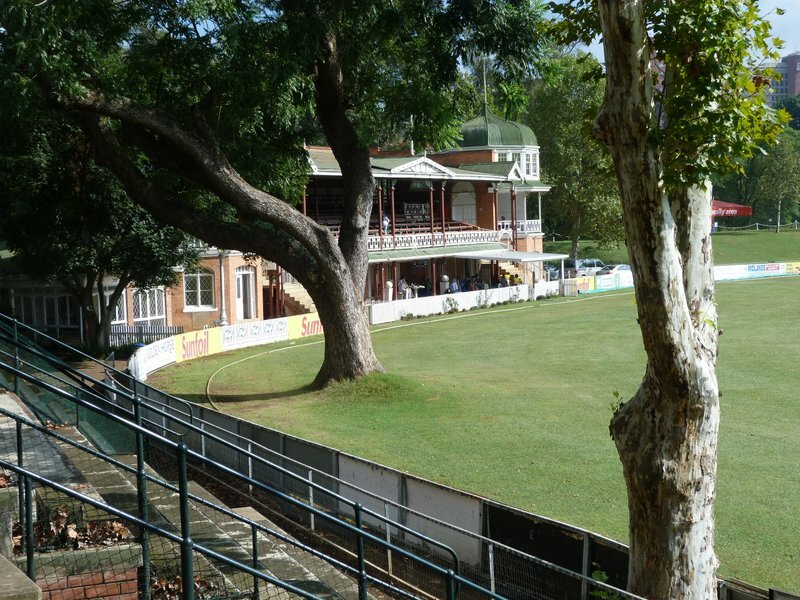 The City Oval sits in Alexandra Park and is just the sort of place that I like to watch cricket. It’s the sort of venue that I’d expect everyone to like to watch cricket. 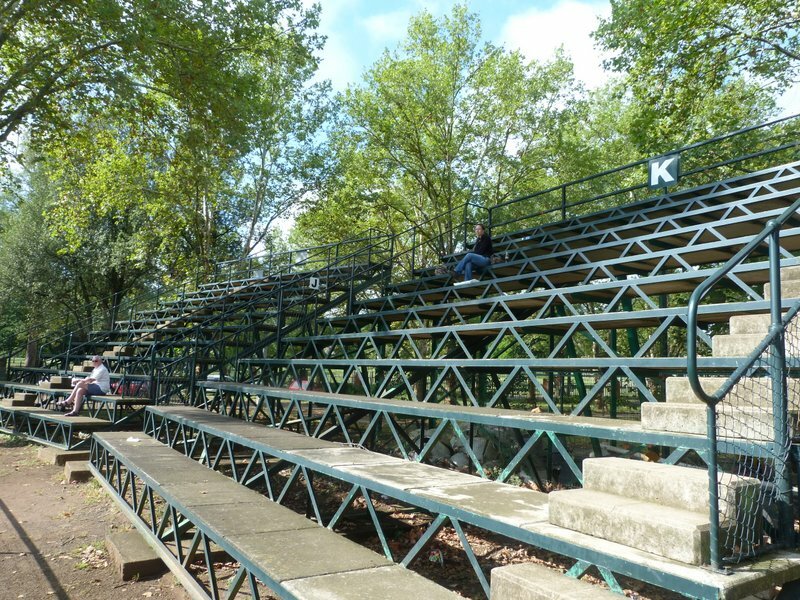 Surrounded by trees, the only permanent looking structure is a Victorian Pavilion, although the ‘temporary’ seating around part of the perimeter looks like it has been there for at least forty years, probably longer. I took a walk around the field and read the series of plaques that outlined some of the history of the place. It has hosted a few MCC touring teams in the past and the feats of the likes of Bill Edrich at the ground are recorded for people like me to stumble upon. One plaque commemorated the planting of a tree by Denis Compton in 1957. Fortunately he had selected a spot beyond the boundary rope, mindful perhaps of the tree on the other side of the ground that was infringing on the outfield by a good five yards. 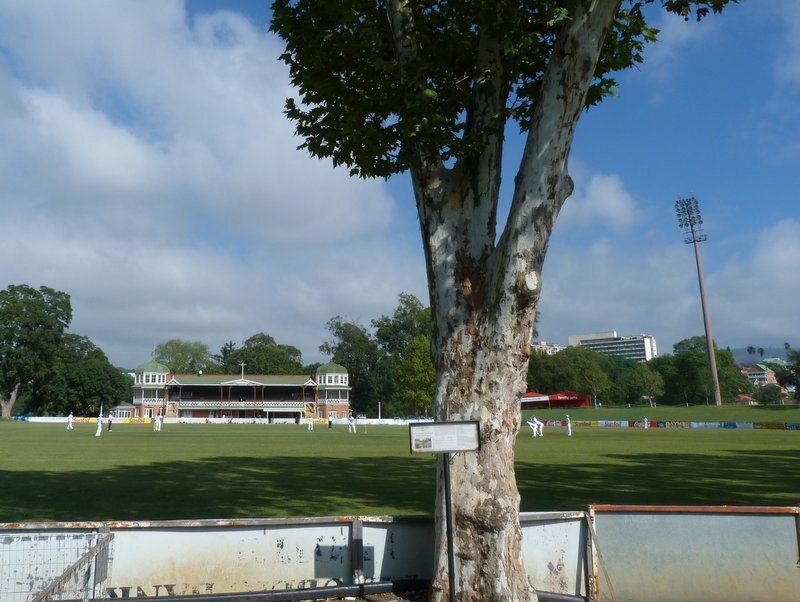 I hadn’t realised that this was one of only two first class grounds with a tree inside the boundary. I was familiar with the one at Kent, but had assumed that this would have been a quirk of quite a few grounds around the world. It isn’t though and if the original damaged tree at Canterbury hadn’t been replaced a few years ago then this one would have been unique. We didn’t quite make it in time for the start of play, missing the first three balls. At that stage there was only one other spectator, an old fella with the look of someone whose wife had sent him outside in the early morning with an instruction to keep out of her way until dinner time. We were joined for five minutes or so by a couple of young lads who I think were just looking for somewhere to sit down for a while. A family of four then briefly swelled the crowd as they walked around the outfield on their way to somewhere else. The Dolphins held out until the third over of the morning before losing their seventh wicket and within three further overs two more of their batsmen were back in that 1898 pavilion with just four runs added to their overnight score. I had been hoping for a little bit more resistance than they put up but I suppose with the result being a foregone conclusion and it also being the final day of the season, everyone involved will have had somewhere else that they’d rather have been. There seemed little likelihood of anyone seeking to prolong matters for the benefit of the three of us in the crowd. The last wicket pair held out for twenty minutes, which was at least fifteen minutes more than I had thought they would, adding another five runs before Beuran Hendricks brought the Dolphins innings to a close and another season to an end. We’d had completely different plans for this Durban weekend. The South African FA had announced a friendly against Argentina and we’d intended to travel on the overnight posh train. As you might have come to expect it didn’t turn out quite as we’d hoped. Firstly the Premier Classe train service between Johannesburg and Durban was discontinued and then, after I’d booked flight tickets instead, the South African FA revealed that they’d decided not to bother with the Argentina game after all. Instead, they would play Nigeria. So, no Messi, although he would probably have played little more than a cameo in a friendly anyway. On the plus side, Nigeria meant Ken Omerou and he’s near enough a Boro player. 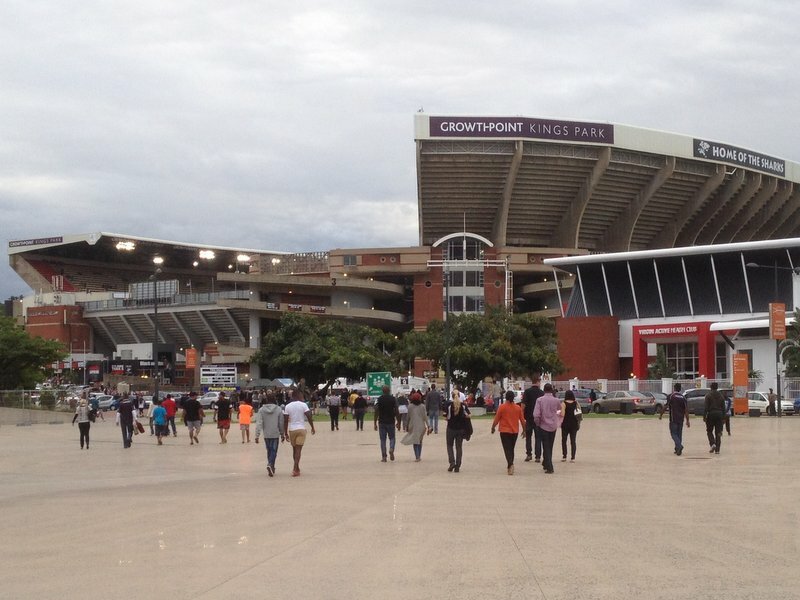 It wasn’t to be though as the South African FA then decided to switch the venue for the game from Durban to Nelspruit. Nelspruit! It’s nearly seven hundred kilometres away from Durban. I can understand that there might have been problems, probably financial, in getting the Argies over, although I’d have preferred that they addressed them before announcing the fixture, but moving the game against the replacement opponents seven hundred kilometres didn’t seem to have much to justify it. 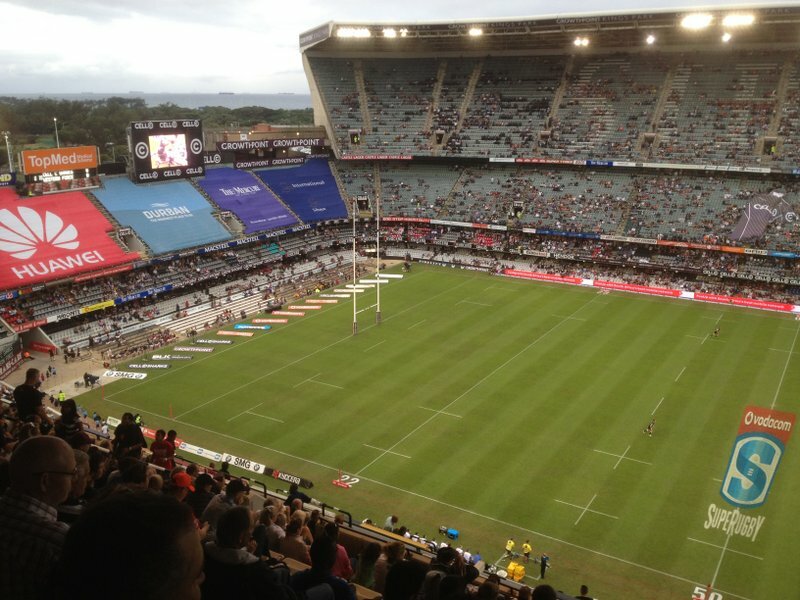 Fortunately there was other stuff going on in Durban and we revised our Saturday plans to include a morning walk at the Kenneth Stainbank Nature Reserve followed by the Super Rugby game between the Sharks and Western Force. We didn’t see much on the ten kilometre hike. A few zebras and plenty of bugs but the monkeys that we’d watched on our last visit were nowhere around. 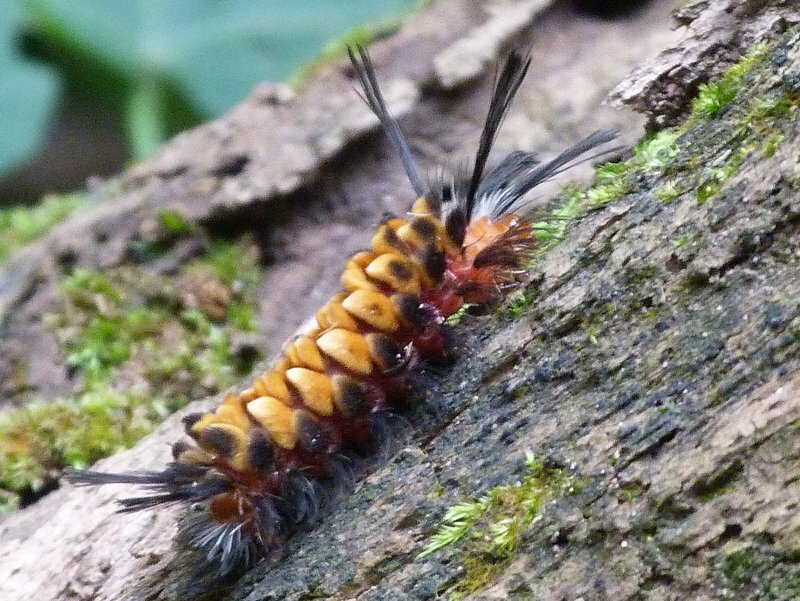 I don’t recall seeing anything like this on my Dad’s cabbages. A twenty-minute walk along the seafront took us to the Kings Park stadium. We arrived ten minutes or so before kick-off and it was still fairly busy outside. We had seats in the Western Stand, which looked quite a lot older than the much taller and steeper Eastern Stand opposite. Getting a drink was easy enough, with two bars servicing the upper section. 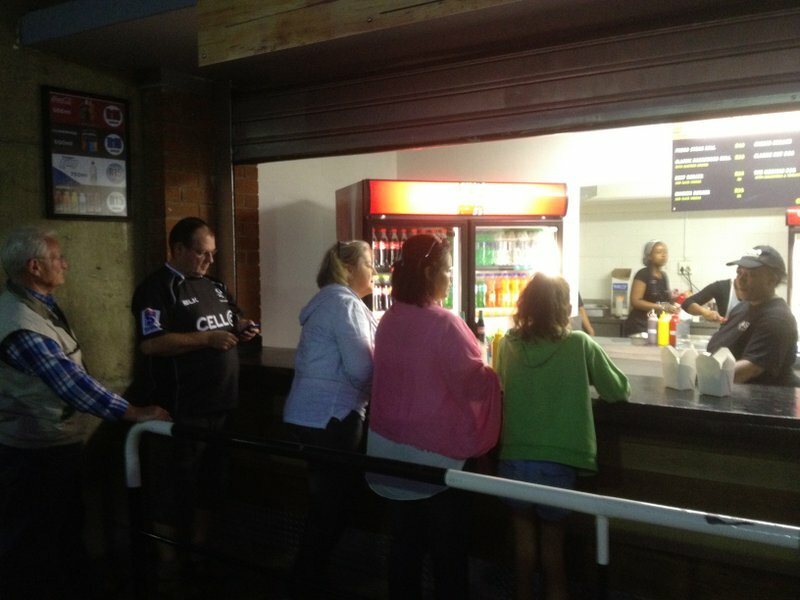 It was good to see that the Sharks management understand that when you go to the rugby you have a drink. We’ve got a few fellas at work who follow the Bulls, despite their policy of making you drink in a field outside of the ground. Madness. View from the Western Stand. A couple of minutes into the game a pigeon sitting up in the roof crapped on Jen. It missed her head but left a Wagon Wheel size deposit on her jeans. Fortunately the crowd probably wasn’t more than seven or eight thousand and we were able to move to seats that didn’t have pigeons loitering above. 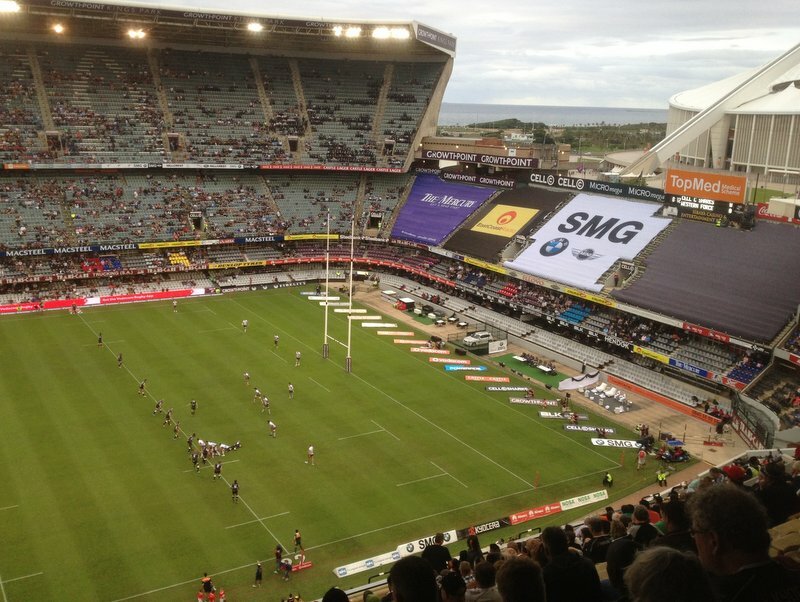 The game itself was fairly poor with both sides making frequent handling and kicking errors. If I was a supporter of either side I imagine I’d have been pretty frustrated with the performance. As it is, I don’t give a toss who wins these games and am there purely for that odd moment of skill that makes it all worthwhile. Moses Mabhida to the right. 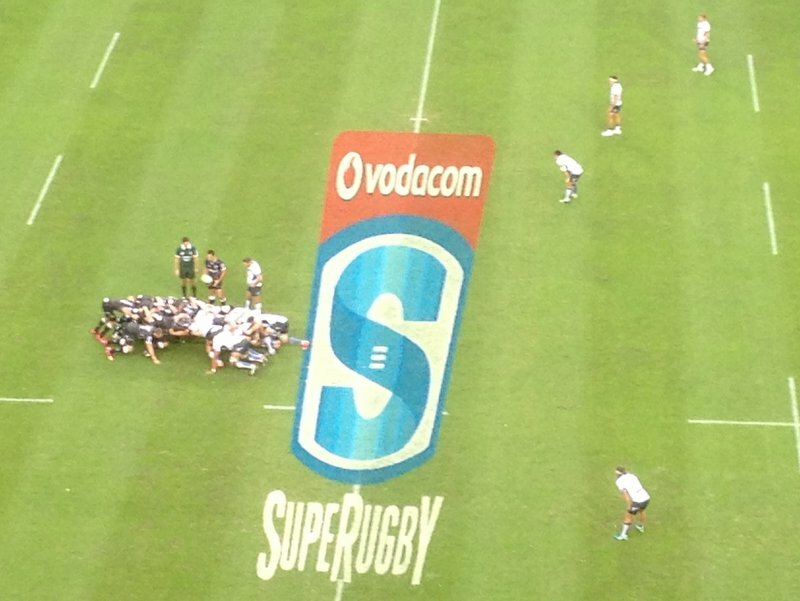 I suppose the best bit of the action was a Shark’s try from Lwazi Mvovo. As the home side ran out 15-9 winners I couldn’t help but glance over to the nearby Moses Mabhida stadium. It’s where I should have been watching Messi.